A 8 suspect mystery set in the Steampunk universe. Set in 1857 and loosely inspired by Wilkie Collins The Moonstone, this mystery can accommodate an unlimited number guests participating as sleuths. You will need a minimum of 8 suspects for this version of the mystery. Suggested investigation time is 2-3 hours. As with all of our mysteries, it is an INSTANT DOWNLOAD mystery package. Need an optional suspect pack for unexpected guests and not-sures? You can add a two optional character expansion pack here or later on from the Witness Pack on the main menu. The year is 1857 and steam power rules, from the upper echelons of society to the gutters of London’s Old Town. Here in the countryside sits Harrison House, a humble estate with a staff of just 20 servants. Harrison House is home to widow Lady Steeles, her daughter Evangeline, servants and, from time to time, friends and passers-by. Tonight was to be a festive celebration in honour of both of Lady Evangeline Steeles’ 21st birthday and also her engagement to Mr. Bartholemew Payne. A mysterious and priceless gift is delivered to Lady Evangeline – one that carries a dark and powerful secret. But when Mr. Payne is found dead at the bottom of a cliff, the celebration quickly turns into a murder investigation! Who pushed him? Where is the legendary Moonstone? 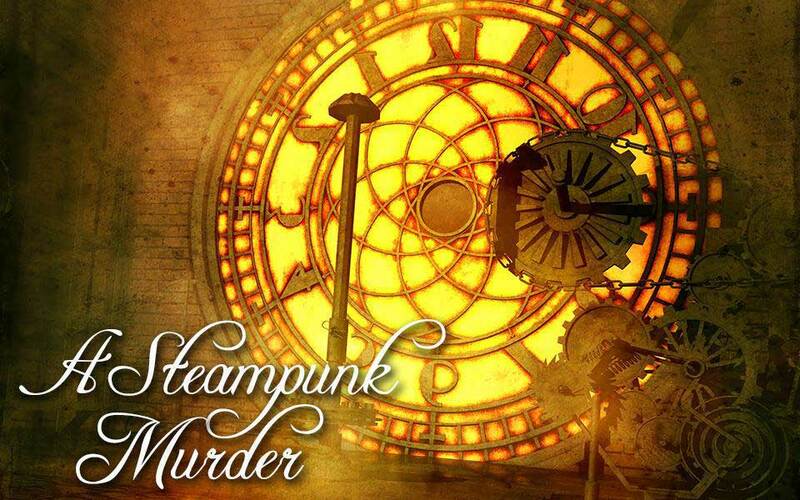 With a cast of characters and lore only found in the Steampunk universe, this mystery is sure to end up hotly debated by suspects and guests alike. This mystery has murder and is rated 4/5 on the “clean” scale. As with all of our mysteries, there is no foul language.